The largest and most beautiful barrel cactus we've ever seen, they almost looked artificial. Boyce Thompson Arboretum near the mining town of Superior AZ. Thousands of different cactus and plants from deserts around the world. Three miles of hiking trails and garden paths throughout. A beautiful relaxing day. Boojum tree in the arboretum. These unusual tress are found in Baja California. So intriguing, they looked like upside down carrots. Roosevelt Dam bridge, a favorite scenic viewpoint. The bridge is next to the Roosevelt Dam, it was built to take traffic off the Roosevelt Dam. Along with the Golden Gate and Brooklyn Bridges it was named one of the top 12 bridges in the nation for overall design, size and eye-appeal. It is the longest 2-lane, single span, steel arch bridge in North America. Sunset over Roosevelt Lake in Tonto Basin. Photo taken from our campground. How fortunate we are to be able to stay in beautiful places like this. More rain than usual this year has the lake up to 70% capacity. We remember last year it was down in the 40% range. Here we are at the Flagstaff airport waiting for our flight out to CT to visit our kids and grandson. The San Francisco peaks are a stand-out in Flagstaff especially when snow capped. There's been more snow than normal this year which is a welcome event for the water shortages in AZ, the forests and deserts are very lush this spring. 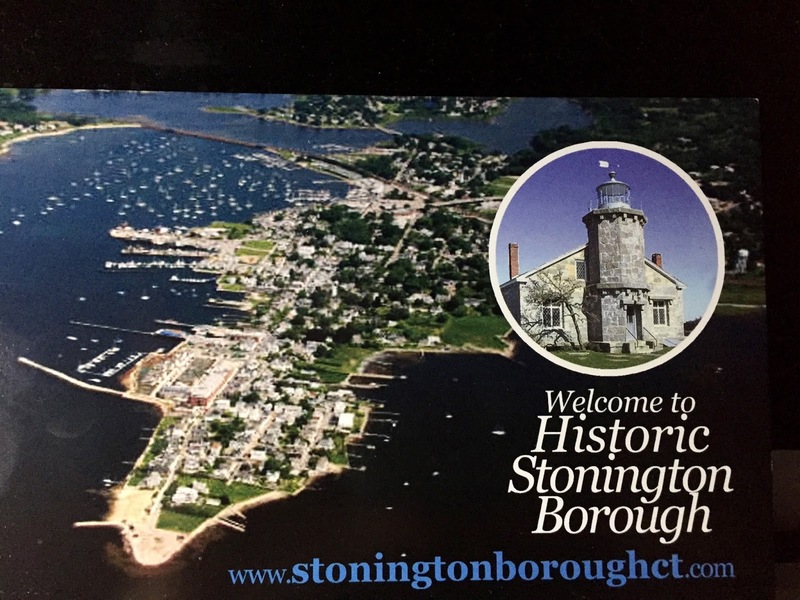 Our kids live in Stonington Burough, the Burough is a very quaint Victorian village set on a spit of land jetting out into the Atlantic. I totally loved walking here. The old massive Victorian houses are spectacular. We walked to the ocean daily, only blocks away in three different directions. March was still a bit chilly, I kept thinking how beautiful it will be in summer. A walk to the ocean and commercial fishing harbor. Many of the historic houses have plaques on them with dates they were built. This house was built in 1836 by a Captain Willcox, a crew member on a ship that had a part in discovering Antarctica. Amtrak runs close to their house, our grandson liked standing on the walking bridge over the tracks and watching the trains. About an hour north of Stonington is Newport, RI. We took a drive to Newport and toured a couple of these old mansions along the coast. Inside the famous Breakers Mansion built by Cornelius Vanderbilt in 1895. Hard to fathom it was built as a summer cottage. Built on a cliff that overlooks the ocean with 70 rooms (many the size of a basketball court). 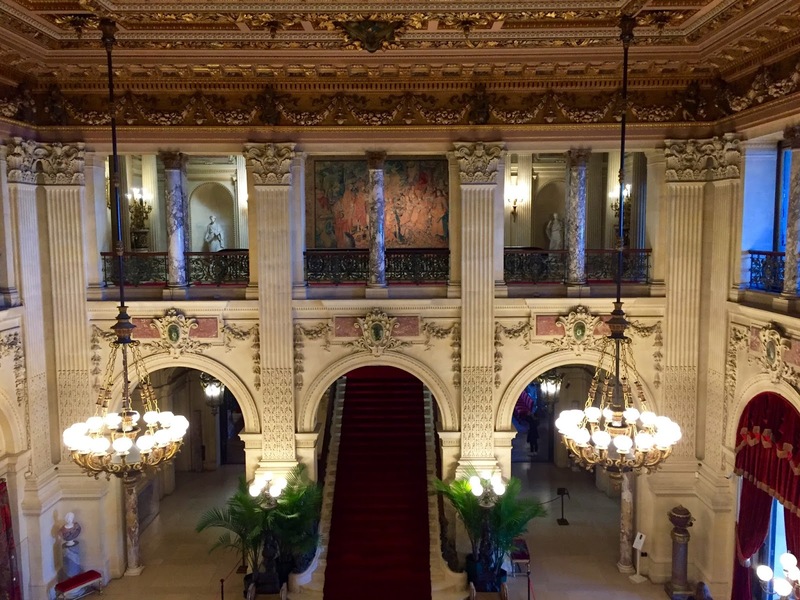 The interior is decorated with marble, rare woods, gold leaf trims...you name it. Whatever it took to make a statement of wealth and status. It was something to see. Although I must say, it was very much for show, over-the-top, and a place I couldn't imagine living in...but then we're far from rich and live in a 30 ft motorhome...and yup, we're very happy. Such a great neighborhood for walks. The ocean is a block away. Our new toy...looking forward to doing some "wheeling" in AZ this summer. Our first little drive to the old ghost town of Two Guns. I-40 is always a busy route, lots of semi trucks. Today we got stuck in a traffic back-up near Kingman AZ, a bad accident miles ahead, three semi's had tangled and all rolled over. When we finally got to the scene, it was evicent one was carrying beer...Miller beer all over the highway. We're onto to Boron CA, going to check out the Borax mine. 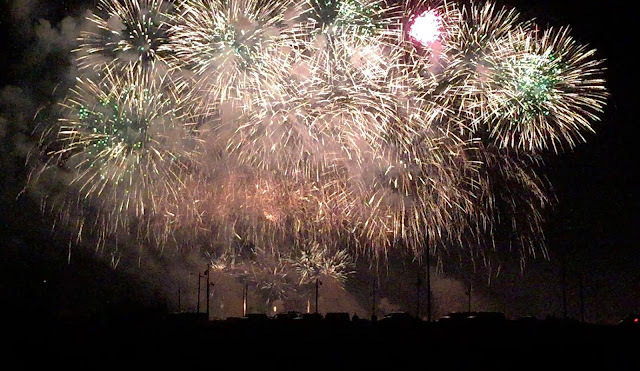 The pyrotechnics show is a gathering of pyrotechnic (fireworks) manufacturers showing off and testing some of their new and most dazzling creations. Fireworks 4 nights in a row beginning about 6:00 and going until 10:00. The colors and different types were some like we'd never seen before. 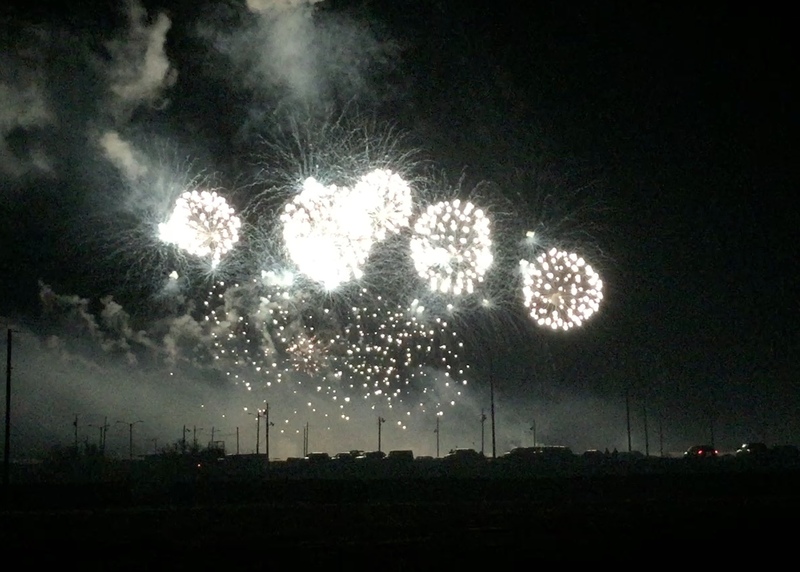 We camped at the Rodeo grounds in Lake Havasu which offers great viewing for the fireworks. Our campsite was located inside an arena, one of our more unusual spots to set up camp. The attendant showing us to our site opened up the gate and ushered us in. I can almost hear some in my family saying....."they finally locked em up", ha ha. Hiking with a friend we've met in our travels. Hike appropriately named "the crack". Thanks to whoever propped up a ladder here. Hike ends with a beautiful view of Lake Havasu. We plan to return to this event again next year.